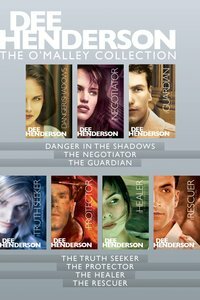 This collection bundles all seven romantic suspense titles in Dee Henderson's best-selling O'Malley series into one e-book for a great value! Introducing the O'Malleys, an inspirational group of seven, all abandoned or orphaned as teens, who have made the choice to become a loyal and committed family. They have chosen their own surname, O'Malley, and have stood by each other through moments of joy and heartache. Their stories are told in CBA best-selling, inspirational romantic suspense novels that rock your heart and restore strength and hope to your spirit. Sara is terrified. She's doing the one thing she cannot afford to do: fall in love with former pro-football player Adam Black, a man everyone knows. Sara's been hidden away in the witness protection program, her safety dependent on staying invisible-and loving Adam could get her killed! FBI agent Dave Richman from Danger in the Shadows is back. He's about to meet Kate O'Malley, and his life will never be the same. She's a hostage negotiator. He protects people. He's about to find out that falling in love with a hostage negotiator is one thing, but keeping her safe is another! A federal judge has been murdered. There is only one witness, and an assassin wants her dead. U.S. Marshall Marcus O'Malley thought he knew the risks of the assignment ... but he was wrong. Women are turning up dead, and Lisa O'Malley has a habit of walking into crime scenes, curious. She's a forensic pathologist, and mysteries are her domain. U.S. marshall Quinn Diamond has found loving her is easier than keeping her safe. Lisa's found the killer, and now she's missing too. Jack O'Malley is a fireman who is fearless when it comes to facing an inferno. But when an arsonist begins targeting his district, his shift, his friends, Jack faces the ultimate challenge: protecting the lady who saw the arsonist before she pays an even higher price. Rachel O'Malley works disasters for a living. Her specialty? Helping children through trauma. When a school shooting rips through her community, she finds herself dealing with more than just grief among the children she is trying to help. One of them saw the shooting, and the gun is still missing. Stephen O'Malley is a paramedic who has been rescuing people all his life. His friend Meghan is in trouble: Stolen jewels are turning up in interesting places, and she's in the middle of it. Stephen is about to run into a night he will never forget-a kidnapping, a tornado, and a race to rescue the woman he loves. About "The O'malley Collection (O'Malley Series)"
Pastor's daughter Dee Henderson is a lifelong resident of Illinois, USA, and currently resides in Springfield. She believes that marketing books should be about the stories rather than the writer, so she keeps a low profile compared to many authors. Her background is in mathematics and computing science (B.Sc 1988) and she had a high paying job as an engineer before she moved into full-time writing in 1996. Her technical expertise has given her an unusually keen insight into the structural aspects of storytelling. The results are plain to see; since 1999, Dee has produced two bestselling fiction series - the acclaimed O'Malley series and Uncommon Heroes - as well as eleven stand-alone titles. Dee's books brilliantly mix suspense and romance, and her characters undergo varied and interesting faith journeys that are integrated skillfully into the storylines. Dee's work has won or been nominated for several prestigious industry awards including the RWA's RITA Award, the Christy Award, the ECPA Gold Medallion, the Holt Medallion, the National Readers' Choice Award, and the Golden Quill. Sara is terrified. She's doing the one thing she cannot afford to do: fall in love with former pro-football player Adam Black, a man everyone knows. Sara's been hidden away in the witness protection program, her safety dependent on staying invisible?? ?and loving Adam could get her killed! A federal judge has been murdered. There is only one witness, and an assassin wants her dead. U.S. Marshall Marcus O'Malley thought he knew the risks of the assignment . . . but he was wrong.